﻿ Augusta Data Storage Releases 2018 Environmental Report - Augusta Data Storage, Inc.
2018 marked another year of exciting changes and growth for our organization! At the end of last year the ETG umbrella got a little larger as we welcomed our new sister company, A1 Bestway, an agent for Mayflower Transit! 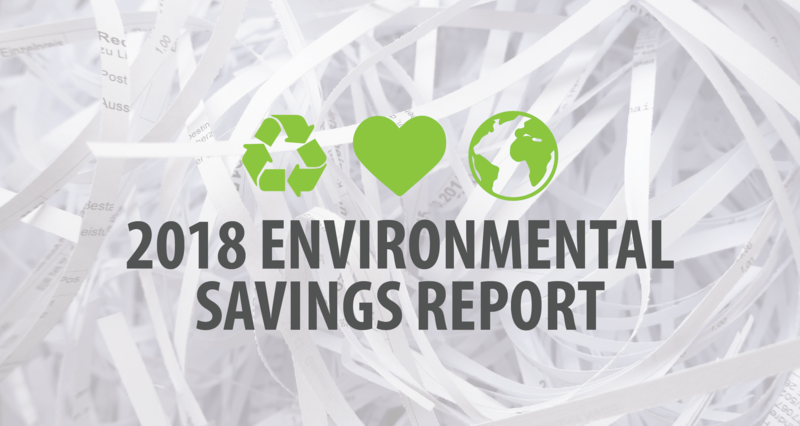 In our Data Storage operation, we saw increases in our shredding and recycling segments and capped out at over 2 million pounds of paper shredded and recycled and that translates into some HUGE environmental savings. In 12 short months we shredded over 1235 TONS of paper, and an additional 110 tons of cardboard from our storage and relocation segments. These totals represent secure shred pick-ups from our local customers, community shred events and drop-off shredding, and annual bulk purges. That means that we were shredding and recycling an average of 100 Tons of paper and 9 Tons of cardboard each month. That’s a lot of shredding. After all our paper pulp is shredded and baled, it is picked up by Georgia Pacific and is recycled to make new products, which allows us to create a substantial environmental savings. These statistics represent the savings from recycling paper products, versus the use of raw materials for the production of new “virgin” paper products. 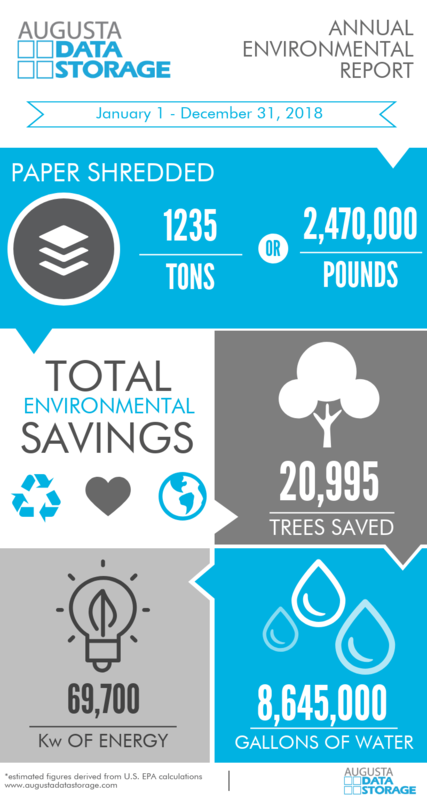 Check out the infographic below for a run-down of our annual environmental savings! In addition to our paper and cardboard shredding and recycling programs, Augusta Data Storage is proud to offer a NAID AAA-Certified E-waste recycling program to help you manage the threat of lost or mishandled outdated electronic devices like laptops, tablets, smartphones and more. We can securely destroy your hard drives and ensure that the parts and pieces are processed for recycling to avoid environmental hazards.